The World Cup is only 59 days away, with the opening match between host nation Brazil and Croatia taking place in Sao Paulo on 12 June. Andy Brassell: "Uruguay kick off England's World Cup group on 14 June against Costa Rica in Fortaleza, but while Liverpool's Luis Suarez is in untouchable form, they do have a worry over one of their other stars. "Paris St-Germain's Edinson Cavani has been clamouring for a chance at centre-forward having played out wide for much of the season, but blew his best chance yet to impress in the central role at Chelsea in the Champions League this week. "The £55m man missed two golden chances to kill the tie in PSG's favour with the score still at 1-0 to the hosts - before Chelsea's late second prevented the French champions reaching the semi-finals. 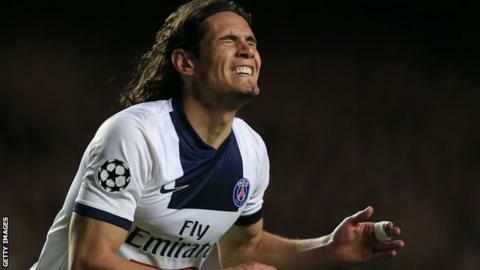 "And Cavani had another miserable night on Sunday as Laurent Blanc's side slumped to a surprise 1-0 defeat at Lyon. After failing to win an early penalty, the 27-year-old cut an increasingly frustrated figure as the match continued - despite again playing in Zlatan Ibrahimovic's customary role at the spearhead. "Ibrahimovic's tendency to drop deep and look to play passes means that Cavani has dropped inside regularly in PSG's games this season. One could argue that the Swede has thus formed a better working relationship with Cavani that any other partner during his club career. "Cavani should continue as lone centre-forward for next Saturday's Coupe de la Ligue final, also against Lyon, at the Stade de France, with Ibrahimovic still likely to be missing with a thigh injury. Blanc needs to reflate his star's slow confidence before then as Cavani seeks a strong end to the season ahead of Brazil." Andy Brassell: "After it looked like France's forward cupboard was bare not too long ago, Didier Deschamps now has options everywhere he looks. Les Bleus coach's first-choice, Karim Benzema, has been in fine form for Real Madrid in recent months, and should edge Arsenal's Olivier Giroud to start against Honduras on 15 June. "The real question is: can any of the other hopefuls force a way into the squad? On-loan Newcastle man Loic Remy seems fairly sure of making it - especially as he can play out wide too - but his recent injury has thrown the spotlight on the claims of some on the periphery. Marseille's Andre-Pierre Gignac, Lyon's Bafetimbi Gomis and Kevin Gameiro of Sevilla have all scored noteworthy goals in the past week. "Gignac's strike at Montpellier on Friday was his 20th of the season. The burly centre-forward, who reportedly rejected a move to West Ham in January, has never scored more in a campaign since arriving at the Velodrome in 2010. Gomis's goal in Lyon's win at Valenciennes last week was his 100th in Ligue 1 (and also his 20th in all competitions this season). "Meanwhile, the mobile Gameiro hit Sevilla's clincher in the impressive Europa League win over Porto, before winning Sunday's derby against Betis with a brace, keeping alive hope of a Champions League spot for the Andalusians. Djibril Cisse, now playing at mid-table Bastia, looks unlikely to get a late call, but he followed his sumptuous volley against Sochaux last week with a clever assist for Florian Raspentino's goal in Saturday's defeat at Evian." Portugal owe much of their qualification for the 2014 World Cup finals to inspirational skipper Cristiano Ronaldo, who fired in a hat-trick in the crucial play-off against Sweden. Real Madrid forward Cristiano Ronaldo is set to miss Wednesday's Copa del Rey final against Barcelona with a muscle injury - and Portugal's World Cup opponents must be secretly hoping the Ballon d'Or winner aggravates the problem over the next couple of months. Real have not indicted how long the ex-Manchester United player could be out for, although Spanish media reports claim he will only be sidelined for a couple of weeks. And that could end up spelling bad news for Portugal's Group G rivals Germany, Ghana and USA, with the brief absence perhaps only serving to reinvigorate 29-year-old Ronaldo ahead of the tournament. Khedira on target for Germany return? Tearing a cruciate ligament just seven months ahead of a World Cup puts your participation at the tournament in grave danger. Germany midfielder Sami Khedira picked up arguably football's most feared injury during November's 1-1 friendly draw against Italy, but he remained optimistic that he would join his international team-mates on the plane to Brazil. And now that prospect looks even more realistic. The Real Madrid player, 27, rejoined his club colleagues on the training pitch for the first time on Sunday, boosting his hopes of being named in Germany boss Joachim Low's squad. Former Inter Milan striker Adriano's assertion that he intended to claim a place in Brazil's World Cup squad always appeared fanciful. Adriano enjoyed his most successful spell at Inter Milan, who he helped win four straight Serie A titles between 2005-06 and 2008-09. On the international stage, he was part of the Brazil team which won the 2004 Copa America and 2005 Confederations Cup. Now these hopes are almost non-existent after the 32-year-old was released by his club Atletico Paranaense. Adriano, who was a regular starter for the Selecao in the 2006 finals, only signed for the Brazilian club in January, marking a return to the professional game after a two-year absence through injury and off-field problems. But he was released by Atletico on Friday after only four matches. The club did not divulge the reasons for his exit, although they claimed it was "in mutual agreement with the player". Local media indicated it was prompted by Adriano, who has scored 27 goals in 48 caps for Brazil up to his last appearance in 2010, failing to turn up for two training sessions last week. Reports also claimed that club directors were upset after Adriano was videotaped at a popular concert in a nightclub the night before he missed training. Italy received a pre-World Cup boost with the news that Fiorentina striker Giuseppe Rossi has returned to training after a knee injury. Former Manchester United striker Rossi scored 14 goals in 18 Serie A games for Fiorentina before his injury. Former Manchester United forward Rossi was Serie A's top goalscorer when he damaged his right knee against Livorno in early January. The 27-year-old was out for 18 months after tearing the anterior cruciate ligament in his same knee in October 2011, prompting fears about the severity of the latest injury. But he rejoined his Fiorentina team-mates in a practice session on Friday, then was named in a 42-man Italy squad which will be put through a series of physical tests next week. Work has resumed at the stadium hosting the World Cup opener after a construction site was reopened after the death of a worker. Host nation Brazil will kick off the tournament when they face Croatia at the Itaquerao in Sao Paulo on 12 June. The stadium is still unfinished after work was temporarily stopped last month when a worker fell from a stand while installing temporary seats and was killed. It was already behind schedule, but organisers insist said this delay will not keep the stadium from being finished in time for the Brazil-Croatia opener.